Guest post by Mark & Ursula (Tink) Boyd, Chaircouple, Australian Catholic Marriage & Family Council. Marriage was as much of a challenge in Jesus’ society as it is in ours – and it broke down there as well. The religious authorities responded to this situation with legalism (if only we can get the rules right…), the disciples with pragmatism (these things happen, so move on to the next marriage…) but Jesus with a breathtaking idealism. 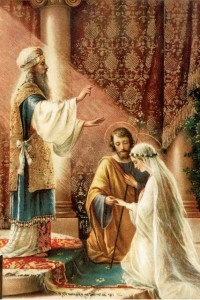 He refers back to the ideal offered in Genesis before the coming of sin as the model on which marriage should be based. Is this realistic? Yes and no. Any normal person who has suffered a divorce, any normal person who is celibate, any normal person who has suffered widowhood can speak about how deeply the desire to bond with a spouse goes in the human person. The pain of the loss or the lack is felt in body, soul and spirit. Often in the rough and tumble of daily life, ordinary married couples do not realize the depth to which they are bonded to their spouse. If you doubt that statement, just talk to someone recently widowed. So when Jesus offers his radical ideal, he is offering something that is written in our flesh and bones. 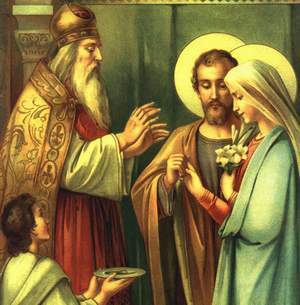 “Marriage of Mary and Joseph.” From an early 1900s Marriage Certificate. Loving God, you have made us to find our fulfillment in loving relationships. In our marriages, in our families, in our communities, in our friendships give us your grace and love to profoundly care for each other. When sin and failure threatens our faithfulness, give us the wisdom and courage of your Spirit to love as Jesus loves. Amen. Originally published by the Canberra Declaration for Awakening, daily devotionals for Australia’s annual month of prayer and repentance.